As a keynote address for your conference. Every delegate gets a drum. 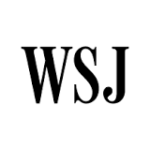 "Awesome experience - tying in our goals and Company expectations – it really was incredible. It’s not often you hear people talking about Sales seminars for days after the event! " Drumming was unanimously voted their favourite part of conference. Feel the energizing effects of the drum circle throughout the day, creating unity and comradely. 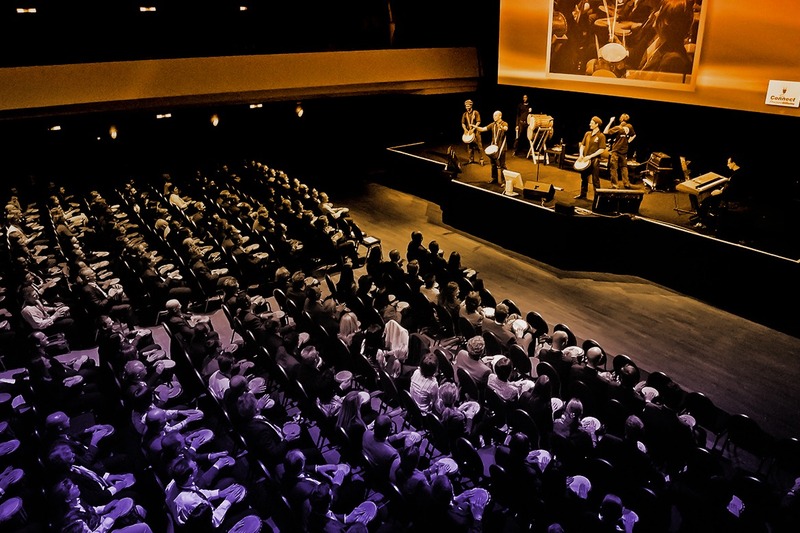 Create the ideal start and ending to your conference, leaving delegates relaxed, focused and connected. Adding an interactive drumming element to your conference will make it exciting, energising and unforgettable. Energise the opening and you will feel the effect the whole day … end on a high note for the closing. Traditionally drumming has been used as a prelude to community functions. 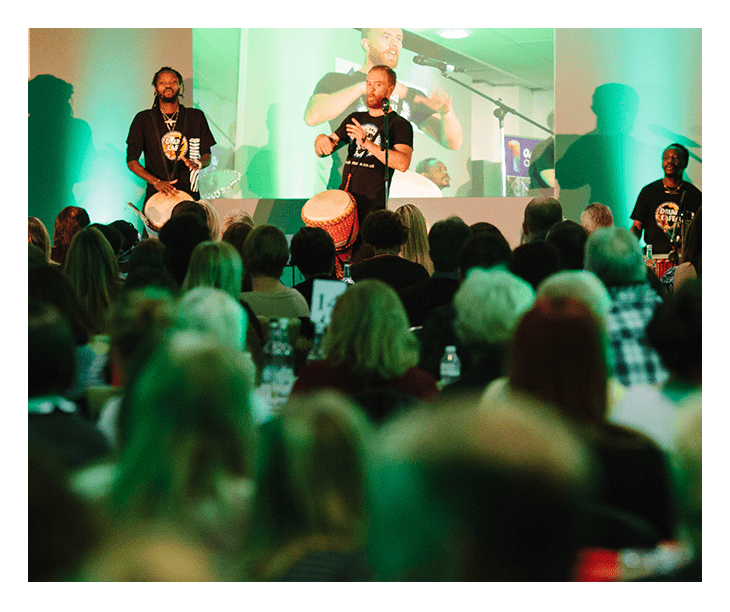 Drumming can be used to great effect to both open and close conferences - drawing people together, celebrating success and ensuring that the delegates leave the interactive conference feeling invigorated and motivated. 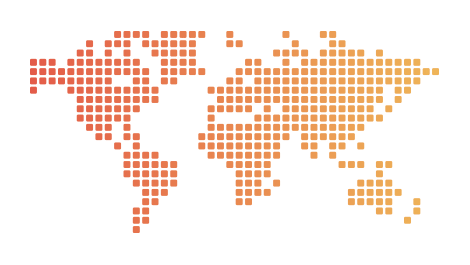 At the beginning of a conference, people are coming from different areas within an organization and some times from different parts of the world. The Drum Café corporate team building and entertainment facilitators, get these gatherings off to a great start, by creating an energy which in turn creates a bonding and a breaking down of barriers both vertically and laterally. At the end of a conference, it is important for the attendees to leave with memorable impressions, a sense of accomplishment and a sense of having had a good time. Having the Drum Cafe close your conference, allows people to leave with memorable impressions of a sense of bonding and a great time. Energizing and boosting your conference. During the course of any conference there comes a point, where attendees' energy levels drop off. Companies spend large sums of money getting people to attend. A lack of energy leads to a lack of focus which in turn results in cost. Nothing like a Drum Cafe “pick em up” in the middle of the conference to get delegates back on track. Attendees tend to be left brain oriented, overusing their mathematical and logical side of their brain. Intervening with a Drum Cafe event encourages right brain activity, thereby stimulating the delegates creativity needed to think out of the box. You will feel the effect of the interactive conference the whole day. It focuses and energizes the group. Large groups of people make an unbelievable orchestra and it all happens in the same room as the conference. 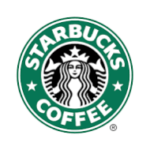 Copyright © 2018 Drum Cafe All rights reserved.